Fol­low­ing my Super­man — Action Comics Vol. 1 write-up, Green Arrow Vol. 1 is next on the read list. Although some oth­er super­heroes are name-dropped, the events here are pret­ty stand-alone. I place it third in the over­all read list because there is a line about no super­hero com­mu­ni­ty exist­ing, which would mean that the Jus­tice League either does not exist yet or is very, very new. The news sta­tion GNN is men­tioned, but it does not exist in this con­ti­nu­ity. Also, this is where Q-Core is intro­duced, and it (or its best pro­duct, the Q-Pad) gets name-dropped in sev­er­al oth­er books. Art over­all is ser­vice­able. Most­ly good, but some of the pos­es and arrow tra­jec­to­ries just did not make sense to me. And the last issue had weird­ly skin-tight clothes on every­one, even civil­ian wear. For Sto­ry, this vol­ume was actu­al­ly two three-issue arcs instead of a sin­gle larg­er one. The first one does a good job of set­ting up Green Arrow’s sit­u­a­tion by high­light­ing the work/superhero bal­ance and his abilities/ideals by set­ting him off again­st enti­tled pow­ered delin­quents. The sec­ond one is more com­pelling to me because Midas is a much more inter­est­ing vil­lain than Rush. How­ev­er, the vil­lains’ back­grounds are per­haps too mys­te­ri­ous (espe­cial­ly after Blood Rose’s “reveal”), and the res­o­lu­tion too easy. Green Arrow beats them once and they run away to Metrop­o­lis? How is that going to work for them? 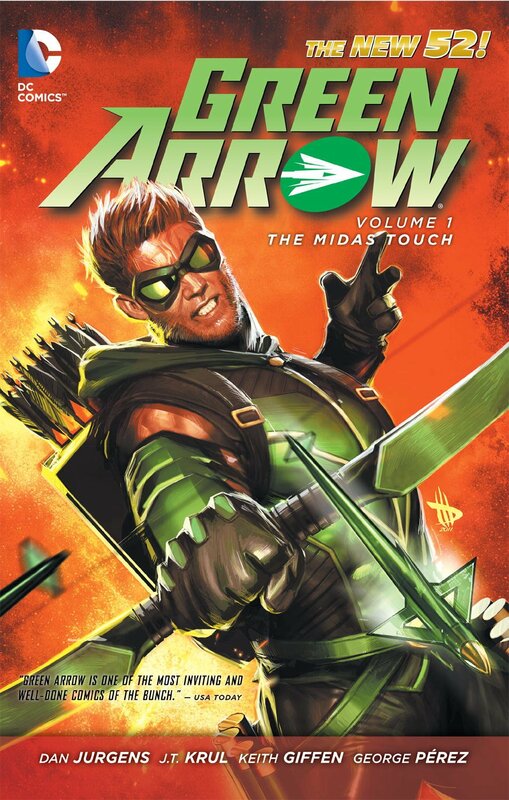 This book intro­duces the char­ac­ters Oliv­er Queen (Green Arrow), Wal­ter Emer­son, Michael Holt (Mr. Ter­ri­fic), Naomi Singh, Dynamix, Dop­pel­gänger, Super­charge, “Jax” Jack­son, Adrien Rivers, Rush, Lime­light, Alpha, Core, Stun­ner, Kyle Emer­son, Blood Rose, Midas, and Alec Hol­land (Swamp Thing). Pan­do­ra gets her cameo in the night­club in Paris where Green Arrow takes on Dynamix, Dop­pel­gänger, and Super­charge. Green Arrow men­tions that he knows Aqua­man. The cor­po­rate life is very demand­ing on Ollie, who only runs Q-Core, a sub­sidiary of Queen Indus­tries, while his deceased father’s friend Wal­ter Emer­son is CEO for the umbrel­la cor­po­ra­tion. WayneTech, Lex­Corp, Holt Indus­tries and rat­tled off as rivals. Next up, Flash Vol. 1.